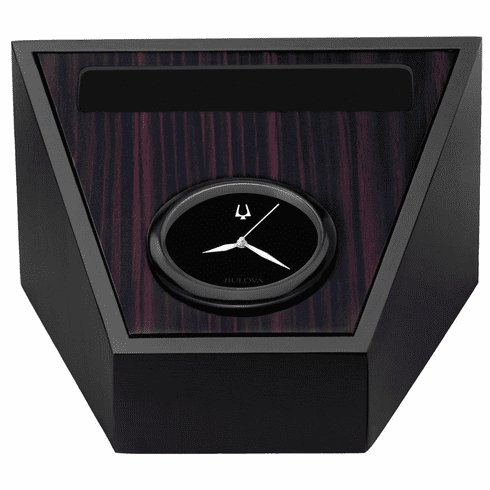 This distinctive wedge-shaped executive desk clock features a black aluminum frame surrounding a contemporary striated wood veneer center. Weighs 3 pounds. Includes storage space behind dial for smart phone, accommodating new, larger sizes, as well as room for a charger cord in the base. Insert allows storage area to be used for business cards. Features glossy black bezel, ebony dial with raised iconic Bulova tuning fork, and protective crystal lens. Housed in an elegant black presentation box. Brushed silver engraving plate included for personalization (3" x .5"). Requires (1) LR43 battery, included. Dimensions: H: 3.25", W: 5.25", D: 5.25"